When you have a good cleaning company working for your business, the work just gets done. You don’t have to manage or follow up to ensure everything is cleaned properly, you don’t have to worry about cleaners not turning up, and you don’t have to deal with cleaners getting in the way of your business. How do you get a cleaning company and a cleaning contract like this, however? Here are nine questions you should ask a potential cleaning company to ensure you get the best. 1. How much experience do they have with commercial cleaning? Domestic and commercial cleaning is not the same, so it’s important to check if the cleaner has experience with commercial cleaning. Try to get an understanding of the extent of that experience too. For example, are they primarily domestic cleaners who have a couple of commercial contracts, or do they have a lot of commercial experience? 2. Do they clean for companies similar to yours? Find out also if they have experience working for companies similar to yours. This could be companies in the same industry, of the same size, or who have premises like yours. It is good if the cleaning company does have this experience. 3. Do they have a good track record? This is about finding out how good they are at what they do. Of course, the cleaning company is going to tell you they are great, but there are ways you can drill into this in more detail. For example, do they have official accreditations or awards, do they work for large companies, or do they have public cleaning contracts. The length of time they are with customers is also a good indicator, i.e. if they have long-term contracts with customers that are regularly renewed. 4. How do they manage their teams? Depending on the size of your business, the cleaning company might send a supervisor, but you will rarely see a manager. It is important, therefore, to understand how their management processes work. If they do you should contact them to get the opinion of a business who has used their cleaning services. 6. Do they have a website? A website is important as it adds credibility. A cleaning company with a professional website is likely to be more legitimate and trustworthy than one that doesn’t. 7. What happens if you have concerns? There are some situations where it is not appropriate to speak to the cleaners who are regularly in your business. You need to know who you can talk to further up the management chain and how your query will be dealt with. 8. Will it be the same people in your business all the time? Most businesses prefer to see the same people all the time as it helps to build trust and consistency. You should also find out what happens if regular cleaners are off sick or on holiday. 9. How do they ensure their cleaners work safely? 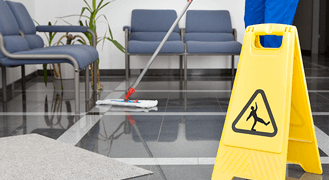 Health and safety is an essential part of running your business, so you should make sure the cleaning company works to the same standards you do. Also, check if they have adequate insurance cover in place. If the cleaning company answers the above nine questions to your satisfaction, you are likely to have a good experience with the contract.